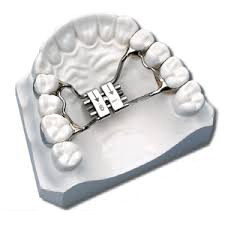 Rapid palatal expanders are used to make the upper jaw wider and correct crossbites. The expander is glued into the patient’s mouth and typically stays in for 5 to 6 months. This is a painless appliance that can make room for teeth that have not yet come into the mouth and prevent asymmetrical growth of the jaw.